The treadmill motor horsepower rating is probably the single most recognizable spec that jumps out at a consumer when he or she begins to do their buying research. It is most likely because we have all heard this term since we were young, and many of us think we know what it means. As tends to be our way of thinking, we usually believe bigger is better. However, the truth is, the ratings and numbers can be very confusing and ultimately incredibly misleading. Here are some tips to help you sort through some of the terms and numbers you may have read about to find out what is really important when trying to understand this integral part of the treadmill. Unless the treadmill has a strong motor, you will easily wear it out. First, check to see what rating terminology the manufacturer is using. Terms like “treadmill duty” and “peak duty” have been used to mislead consumers in the past to raise the rating number (remember the assumption that bigger is better). What do each of those mean? Treadmill Duty – somewhere in between peak and continuous. Treadmill duty measures the likely horsepower for an average user at an average speed over an average period of time. But because it is an average, it is not a true representation of power. Peak Duty – Maximum horsepower a motor can generate when working at its hardest. This is only sustainable for a short time. Or Peak duty motors measure power at the highest possible rpm with minimal load. But since an efficient motor is not going to run at this high rpm all the time, it is not an accurate horsepower measurement. When shopping for a treadmill, look for a Continuous Duty Rating (CHP). A continuous duty motor measures the minimum horsepower delivered at all points during a workout, and is a commercial grade standard applied to treadmills used in health clubs and higher-quality home treadmills. Continuous duty motors are the highest quality available. They are more powerful, they last longer, and they deliver smooth performance. Minimum recommendations have always been at least 1.5 CHP, but you’ll be hard pressed to find a treadmill with such a low rating these days because of all the marketing hype. However, if done right, a 1.5 CHP motor with an RPM rating below 4000 would satisfy the needs of 90 percent of home users. Rotations per Minute (RPMs) is really important in motor design. The relationship between continuous horsepower and RPM is torque. This is the most significant factor when determining the best suitable motor for you needs. The lower the RPM of a motor, the more torque it will have – torque being the measure of a tendency to cause rotation; in other words, the power to turn. This allows the motor to last longer. I strongly recommend a motor with an RPM rating of 4000 or lower, but never more than 5000. This is crucial because this is where a lot of manufacturers begin to play with, and boost, the ratings above 2.5 in to the 3.5 and 4 HP range. In a lot of those cases, if we examine the plate stamped on the treadmill, you will find RPM ratings in the 7000 to 8000 range. This is how they can get away with these bloated HP rating numbers. These motors are spinning way too fast and working way too hard to last the years you should expect out of a quality treadmill. RPM tinkering is only one way in which a manufacturer can boost the horsepower rating of a treadmill motor. 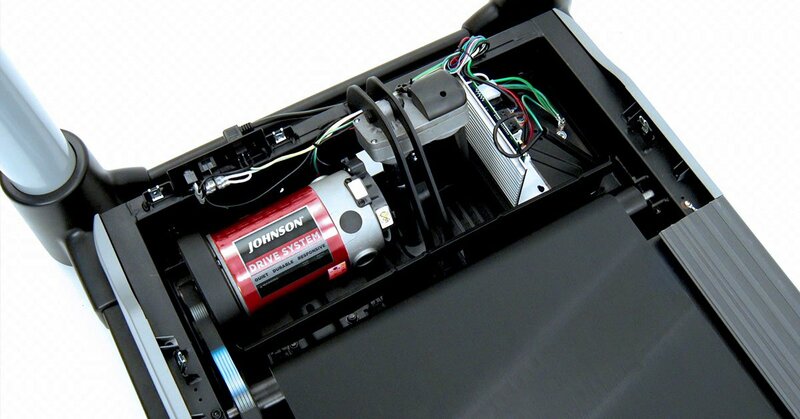 Finally, there are the electrical requirements needed to support a larger HP motor. Most homes today have either a 15- or 20-Amp circuit, which you plug the treadmill into. Most 20-Amp lines will only support 2.4 horsepower from an electrical motor for a continuous period of time. So all the “extra” horsepower, if the rating is true, is nice but totally not needed and never really used. On a related note, it is nice to have a big, strong, powerful motor in your treadmill, but it is just as important to surround that motor with up to date quality components (more on that later). If done properly, the motor won’t have to do all the work so the load can be shared amongst all the integral parts. They reduce the need for overblown horsepower ratings and produce a much more efficient running treadmill – A sort of brains over brawn scenario. What this all means is that the customer should be more concerned with how well all these parts of the treadmill work together, rather than with a hyped up horsepower rating placed on a website or printed in a brochure. Look for a solid motor with CHP rating and low RPM’s and go from there. Motors are one of the most important factors when shopping for a treadmill, but there are other features to consider as well. Does the belt need maintenance? Is the belt cushioned? The belt quality is just as important as motor when you’re shopping for a durable treadmill. The belt and the motor work in tandem to create a smooth, efficient walking or running experience. The graphic below shoes some of the other features to consider in a treadmill. Browse treadmills with continuous-duty motors and low (and in most cases no!) belt maintenance. keyboard_arrow_left Fitness Equipment and Location, Location, Location!